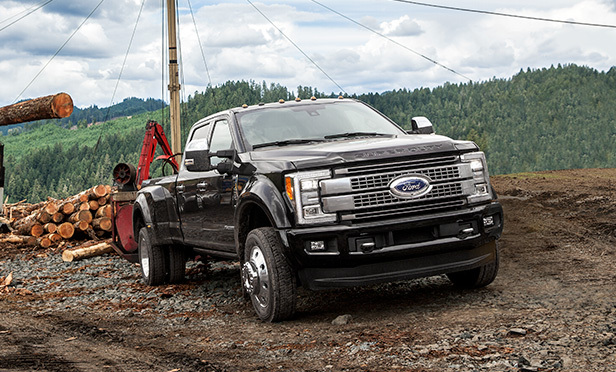 2017 Super Duty—the toughest, smartest, most capable one ever—puts in a full day’s work at an innovative sawmill…and helps tow impressive amounts of lumber. With a slight press of the accelerator, 925 lb.-ft. of torque kicks in as our 2017 Super Duty roars to life, all set to work. We’re here at the Seneca Sawmill today to put the intrepid 2017 Super Duty through its paces in one of the world’s toughest jobs—logging—and to learn how this innovative mill is using modern technology to shake up an iconic industry. A quick glance around drives home the vastness of our “office”: Trees, mountains and steep roads stretch for miles in the distance, leading out to Eugene, Ore. Noises from imposing machines fill the air. It is gorgeous and a little terrifying at the same time. But it’s no challenge for the mighty Super Duty. 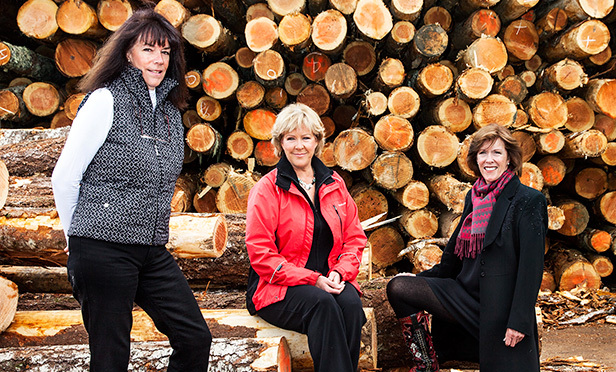 Seneca Sawmill is owned by three sisters—Kathy, Jody and Becky Jones-who are continually finding ways to improve safety and sustainability in what’s traditionally a very dangerous vocation. We’ll meet up with them at the mill later, but first, we want to witness some of their smart machinery out where the most strenuous work is being done: on the sides of mountains. Co-owners (from left) Kathy, Jody and Becky grew up in Seneca’s lumberyard. 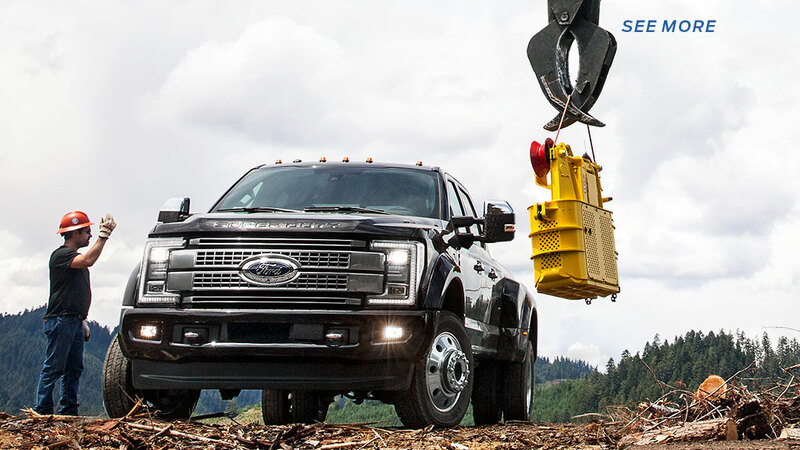 To reach the logging site, we have to maneuver the Super Duty up twisting mountain trails—and I am astonished to feel the adaptive steering technology* effortlessly guide us around extremely sharp curves. Above us, Douglas firs loom, bathing the dirt road in murky shadow. Calling these trees big would be an understatement; they make East Coast birches look like asparagus stalks. As we roll into the camp, the romantic vision of lumberjacks at work—plaid shirts, blue oxen and simple bow saws—is nowhere to be found. Instead, a 70-foot tower rises vertically from the hilltop. Several cables attach to its top, each running down a neighboring slope. Loggers tie cables around the fallen trees, then attach them to a carriage, explains Casey Roscoe, who is senior vice president of public relations at Seneca Sawmill and also happens to be Kathy Jones’ daughter. She points to a yellow carriage that looks almost like a large ski gondola car, running along one of the lines attached to the tower. “When the carriage is all loaded up, it returns to the tower, dragging the trees.” The crew communicates through a system of shrill whistle blasts that echo through the mountain air. In front of us, massive machines grab each log, effortlessly sawing them into appropriate lengths. Then a gargantuan claw collects the sections and sorts them by size into neat piles. Somehow, all these actions happen simultaneously, a remarkable concerto of flying wood and clanging metal. It’s quickly apparent that the sisters have a strong desire to build upon the dreams of their father, who died in 2014. “Dad loved the idea that a contractor could feel like he had just gotten the best unit of lumber he could ever buy,” Kathy says reverently. This desire motivates the three to continuously advance the mill’s technology. Jody points to benefits beyond increasing safety, though: “We use every bit of the log now.” Besides the lumber, they use shavings for agriculture and chips for paper. The sawdust and bark are burned in a generator that provides the local power grid with enough electricity to service 13,000 area homes. On the processing floor, a deafening roar surrounds us. The mill boasts a degree of automation that seems more at home in the future than the present. “Machines make the decisions a lot around here now,” Jody explains. Lasers scan each log and rapidly identify the optimal cuts of lumber, based on the tree’s size and shape. This information is relayed to a computer database, which compares potential yields with yesterday’s market prices. The computer then decides the best cut and sets the saw blades accordingly. Finally, the log is shuttled through a series of saws, producing the boards the computer preordained. Back outside, we load pile after pile of finished boards onto a trailer, then attach it to the Super Duty. The vehicle’s rear camera easily facilitates lining up the gooseneck hitch—but we soon realize this technology can assist us in even more ways. When we come up a tight corner between two lumber piles, I’m instantly grateful for the truck’s seven rearview cameras. ** Towing 27,000 lbs. around a tight turn? No problem at all. After we’ve loaded a 2,600 lb. carriage into the truck bed of the Super Duty, the optional driver and passenger’s side multicontour seats are a welcome feature, massaging my back and legs. But it’s when we hit the dirt roads that I can barely contain my amazement: Taking a turn feels effortless, even with a ton of machinery in back. Aaaah. We deliver the carriage, hop out and walk over to greet Kevin Tuers, one of Seneca’s foresters. A drone hovers over Tuers’ shoulder. “I use the drone’s camera to monitor the health of the trees,” Tuers explains. Seneca recently celebrated planting its 36-millionth tree. This keeps the forest green and lush and provides Seneca with future revenue. “The better we do our job growing trees, the more we can cut,” Tuers says. He gestures to the hillside, a patchwork quilt of trees in various stages of growth—from bald, recently logged sections to towering trees planted decades earlier. “We have 92% more wood [on the land] today than when we bought it,” he notes, which bodes well for both Seneca and the health of future forests. As I hop back into the mighty Super Duty after a full day of conquering some of the toughest work possible, the Jones family dream comes into focus: Make a great product, invest in the most powerful technology and try to make the world a better place. Smart words to live by. **Driver-assist features are supplemental and do not replace the driver’s attention, judgment, and need to control the vehicle.